Pink Lemonade: The cutest fruit you will ever meet! The cutest fruit you will ever meet! A friend of mine is an avid gardener - not only is she really great at it, she loves to plant new and interesting fruits and veggies and is super generous about sharing the bounty! 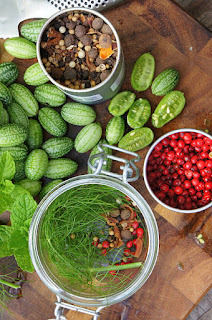 At the very beginning of spring she told me of the awesome things she was planning for her garden this year - one of them being a fun, tiny fruit called the cucamelon. We were both excited to see how this little gem would taste once harvested and I finally got the chance! These little gems are about an inch long but look just like a watermelon - no, really, they are adorable!! Just to give you a better idea of their size, the plate I photographed them on is a saucer from a demitasse cup. After I initially photographed them I had to give them a try - so fun, just pop them in your mouth for a pop of flavor. 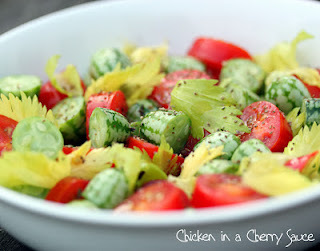 The outside has the texture similar to a very thin watermelon rind and inside you get flavors of cucumber along with a little sour lime just to keep things interesting. 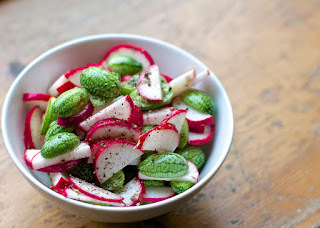 How awesome would this salad be if you used watermelon radishes??? 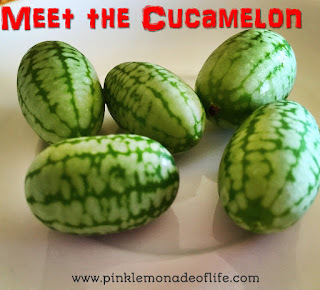 You will also find everything you need to know about growing your own cucamelons on this page! So go ahead, be brave - give the cuamelon a try.